This week I’m celebrating the incredible job our team has done in hosting Camp Rock . . . our two week, two location arts and media camp. I’m so proud of what our team has done I thought I’d let you in on some “small” stuff that made a big difference! People like seeing pictures of themselves . . . parents like seeing pictures of their kids . . . friends like to share pictures of each other. Don’t believe me? Facebook has realized the importance of photos in developing community . . . and as a results photos are core to it’s strategy . . . the results are astonishing! At Camp we’re integrating photos in a few different ways to help “plus” the event! 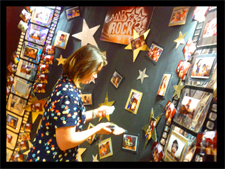 Photo Wall – As parents arrive to drop off their kids in the morning there are photos from the day before that they are encouraged to take with them. Award Photos – Every day we give a handful of campers an award that is nominated by staff and other campers. We take a photo of them holding up a certificate and standing beside a statute . . . the next morning parents can pick that up in a nice frame. The cost of doing photos is crazy small in comparison to the perceived value. It’s an ideal “souvenir” to provide for your people. With a little preplanning it would be a great thing to include for your next event! Here are few things to think through when planning! Releases – Make sure you find a way to get “consent” from people at the event to take the photo and use it for promotional use. I’m amazed at how many parents have not allowed us to take photos. We just have these kids name tags a different color. More than one Team Member! – It’s going to take more than one volunteer photographer to capture even a modest event. For Camp Rock we’ve had at least two photographers on at any given moment. For larger events, like the 5k we run, we’ve had as many as 10 photographers going!